Awhile ago, I tried making five meals in five hours in an attempt to avoid the daily "What's for Dinner" question. I scoured my favorite recipes and found five meals that I could make in an afternoon. Some I could freeze for later, as well. In Ottawa, there is a business called Dinner Essentials where you can go and make several meals at once. They do the shopping, prepping and clean-up. You do the assembly at their store and the cooking at home. Although I haven't tried this, it sounds appealing. The goal is the same: to have some prepared meals ready to go after a busy day. First up is a Savory Pot Roast from Light Cooking for Two. This is my favorite pot roast recipe that my parents hooked me up with after I gave them this cookbook. A pot roast is a brown braise, where meat is browned first (seared) and then dark ingredients, such as red wine or tomato sauce, are added. The goal is to take a tough piece of meat and tenderize it by roasting it slowly in some flavorful liquid. The heat melts the connective tissue in the meat slowly, making the meat fork-tender. 1. Dry the meat with a paper towel (so that it browns better). 4. Add the aromatics and liquid so that it covers 1/3 of the meat. 7. Add mirepoix (carrots, celery and onion). While this is roasting, you can prepare the next meal (coming up tomorrow). In a roasting pan, heat the butter and oil on medium-high heat. Sear roast on each side. Add beef broth, garlic, lemon juice, pepper, tomato sauce and bay leaves. Ensure the liquid covers 1/3 of the meat (adding water if necessary). Cover and simmer for 1 hour 45 minutes. Add carrots, celery and onion and cook for 45 minutes, or until meat is tender and cooked to the desired temperature. Remove and discard bay leaves. Discard vegetables. Roast to a temperature just a bit less than done so that when you reheat it, the meat will be perfect. Slice the beef and wrap between layers of wax paper. Recommended freezing time: 6-12 months. Thaw overnight in the refrigerator. Heat the slices and sauce in the microwave. To save time, use bottled minced garlic and bottled lemon juice. To save money, mince your own garlic and squeeze your own lemon. 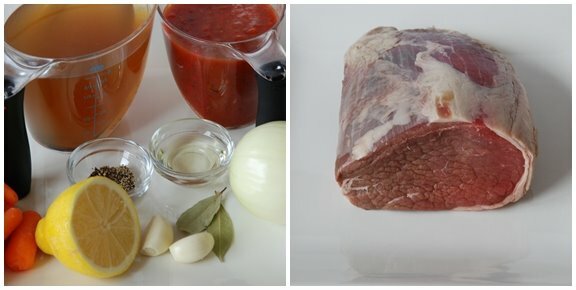 Although I used homemade beef stock in my version, I will use store-bought next time. The extra salt was missing in my au naturel version. This is a favorite meal at our house. And the smell while it's roasting is pure comfort. When I was a fledgling teacher my mentor swore by this business of getting a week's worth of dinner made and stored before the weekend was over. Although I tried, the best I got was to plan the meals, shop for the ingredients, and stick to my plan. 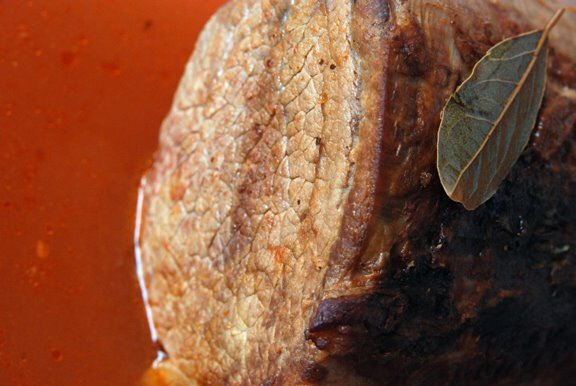 Great roast recipe to start off! What a great idea! With spring sports beginning, I may have to try cooking several meals on the weekends so we aren't scrambling for dinner each night. That looks fantastic - soooo comforting! That looks really wonderful. We have Dinner by Design here and I have used it numerous times. Not only can you go and do it (after they shop, chop, prep, provide all the containers, etc. ), they also have a policy that for a small fee (and it is small), they will assemble it all for you, you just show up and take it home and put it in your freezer. When I was so ill, I ordered this way from them and the guys would go pick it up and we would have lovely fresh homemade meals the whole time I was too ill to cook much. It's been nice...a bit pricey, but worth it when you would consider all the time, money, etc. the guys would have spent eating out all that time. Ciao Shari I love your idea !! I'm waiting for more !! What a fabulous idea!! And the pot roast seems like a great start to a week of wonderful meals. I've always wondered about those "prepare your dinners and cook them at home" places, but hey, you did it at your own home for less money!! And man, does everything on your menu sound delish.